September 29, 2015 bcalvanocoachingLeave a Comment on Weekly Angel Messages for September 28th through October 4th. Weekly Angel Messages for September 28th through October 4th. Weekly Messages for September 28th through October 4th. I had a wonderful time this past Sunday at the Awaken Fair in Fort Lee, New Jersey where I met some beautiful souls and channeled angel messages and healings. My next Awaken Fair will be November 22nd in Tarrytown, New York. In addition to giving readings I will also be presenting a talk on calling in the angels and presencing their love and wisdom. For more information see http://www.awakenfair.com . 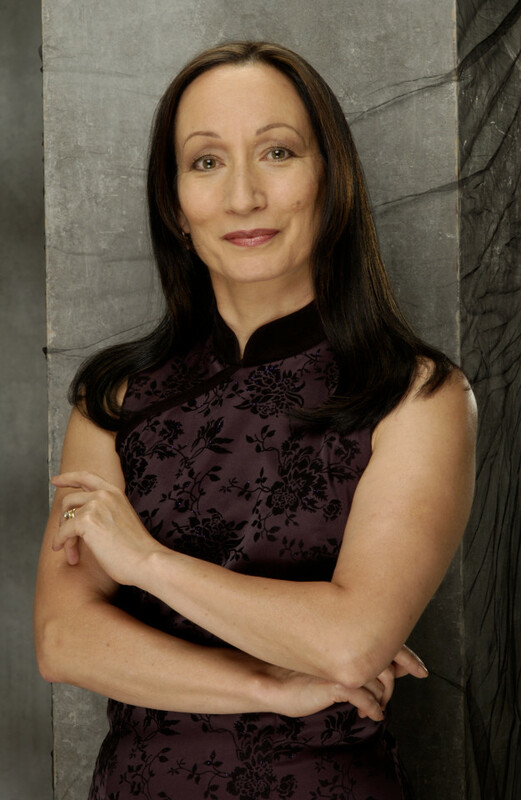 I will be in Middletown, New York, October 24th giving readings at the Bodhi Tree shop in Galleria Mall. http://www.thebodhitreelife.com. In addition to my phone and Skype sessions I have some in person appointments available in New York city at the Kessel Wellness Center at 481 Third Avenue. My next BlogTalk Radio Show will be this Friday at 4 pm on October 2nd due to my traveling for an angel event. Join me at http://www.blogtalkradio.com/letsasktheangels and call in at 424-6775-6837 for a reading. I also am guided to share with you a new service I am providing. I channel angel prayer messages by email and audio recording for you and your loved ones. This is to promote dynamic healing and powerful angelic connections. 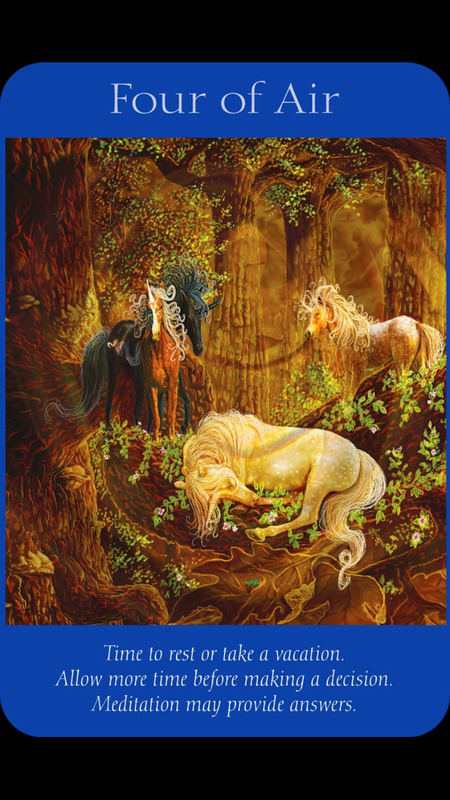 This week I was guided to use the Angel Tarot Oracle Cards deck by Doreen Virtue and Radleigh Valentine. For Monday and Tuesday we have the card, Four of Air. The message is ‘Time to rest or take a vacation. Allow more time before making a decision. Meditation may provide answers.’ The early part of the week we may be feeling the need to take a break from all the heightened shifting planetary energies including the Full moon and Lunar Eclipse. We are feeling very stimulated by many new ideas, experiences and possibilities. It will be more valuable to slow down and take care of yourself as you allow all this new energy to settle in. By taking the time to go within through stillness and meditation you will gain more clarity as to which direction to take. 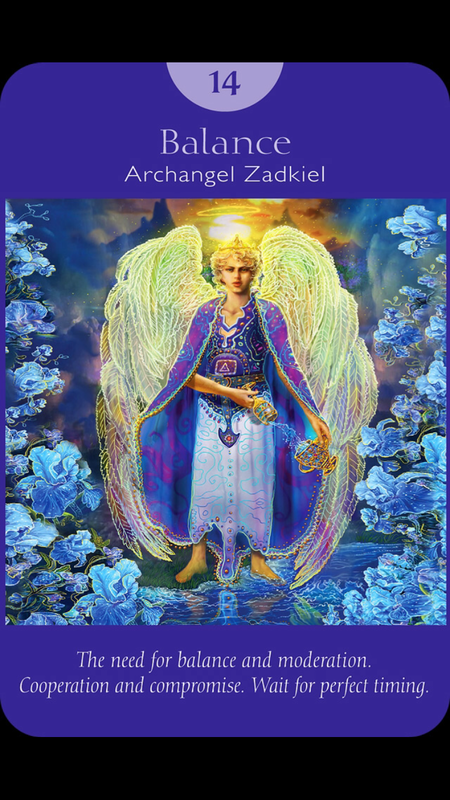 For Wednesday and Thursday we have the card, Balance with Archangel Zadkiel, ‘The need for balance and moderation. Cooperation and compromise. Wait for perfect timing.’ This message also recommends not rushing forward if there is lack of clarity or balance. Zadkiel helps us remember who we really are as spiritual beings living in a physical body. We are being asked to find a new way to be and work. There is a new energy for allowing balance in our lives with grace and ease allowing for truer partnerships and empowering loving support. The planetary shift that is occurring is about leading from our heart as opposed to purely mental choices and reactions. There is a deeper wisdom that is in us that is more readily available at this time. We have the opportunity to accept this new way of living, trusting the flow of life and of being peaceful. 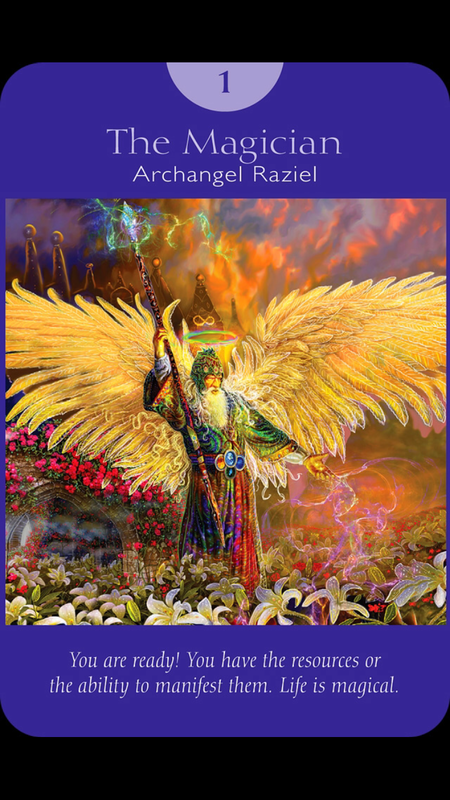 For the end of the week and weekend we have the card, The Magician with Archangel Raziel ,‘You are ready! You have the resources or the ability to manifest them. Life is magical.’ At the end of the week there is more clarity and answers to your questions about how to manifest and create your next projects. Raziel opens the doors to your spiritual growth and also to speeden your manifestation success. You will notice unexpected support in ideas and resources show up. For some there is no more need to take classes for now.You have what it takes to make it happen. You are ready! This week starts off with the possible need for rest or renewal after the the powerful planetary energy shifts that have taken place with the Full Moon, Lunar eclipse and more. There is a need to bring balance with this new energy with ourselves and with our partnerships. By the end of the week we experience a new found level of confidence and support to make our ideas and projects happen. There is a clarity and confidence with new doors opening for you. We are ready for a powerful new cycle of magical manifestations! November 22nd at the Tarrytown Awaken Fair http://www.awakenfair.com I will be speaking on the topic of calling forth the angels divine love and wisdom and I will be giving angelic guidance and healings/ life coaching in 15 &30 minute sessions. Pre book your session and receive a discount. Previous Weekly Angel Messages for September 21st through 27th. Next Join me at my NEW time slot on BlogTalk Radio MONDAY at 1PM EST.